STEPHEN WIEST, born the day after Pearl Harbor, has worked as a janitor, bartender, Fuller Brush salesman, printer, and gardener for people who like flowers but not dirt. In the late sixties, he was poet-in-residence at The Johns Hopkins University's famed Writing Seminars, under Elliott Coleman. He lives in Rock Hall, Maryland, an old waterman’s town on the Chesapeake Bay. 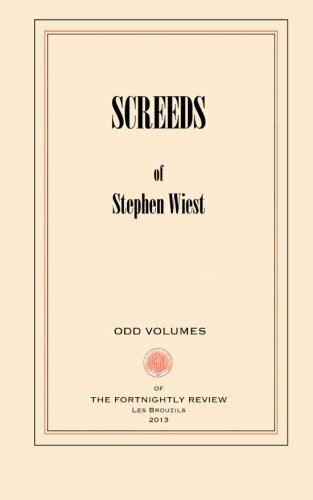 Although he has written five books of poetry and four novels, this final version of Screeds is his first publication in twenty-six years, and the first title in the prestigious Fortnightly Review's series of "Odd Volumes."